Media personality, Gbemi Olateru has been trending online after her tweets on marriage went viral. Lots of individuals have keyed into the conversation and have left their thoughts on her tweets. She said: “Our generation has a lot of work to do. 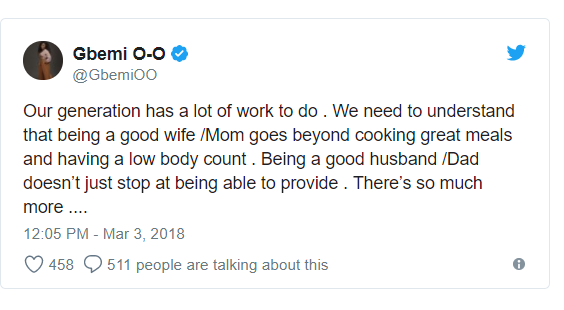 We need to understand that being a good wife /Mom goes beyond cooking great meals and having a low body count. Being a good husband /Dad doesn’t just stop at being able to provide. There’s so much more. Let’s say your father was a great provider – He paid for EVERYTHING – it still doesn’t make him a great father . What if he used his money to bully you , your siblings or your mom into doing the things that HE WANTED? Or let’s say your mom was the best cook EVER! From Naija to continental dishes – she was the best ! But she was emotionally abusive to you/ your siblings and made you feel worthless with her words? Being a great cook does not a great mother make .